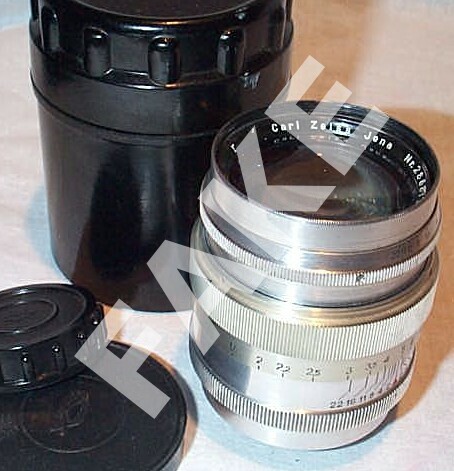 Zeiss Sonnar lenses of World-War-II-era are often faked from vulgar Russian Jupiter lenses by simple changing the front-ring, and sometimes engraving the barrell with "Made in Germany" or something. 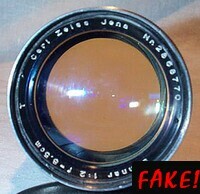 This faking is alleviated due to the fact that parts of the Carl Zeiss Jena lens plant and machines were disassembled and rebuild in Russia after the war, as well with many workers, engineers, parts and maybe whole lenses going with them, and were build quite unchanged as Russian lenses until youngest present. So it's hard to distinguish them. Sellers and collectors, please be aware! When it is not a fake? - if it says "Jupiter" or something kyrillic in the front ring. 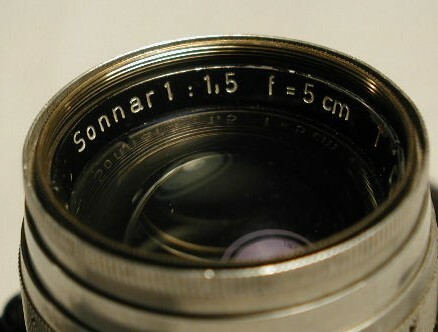 The Zeiss Sonnar were great designs, leading the fast 35mm lens class for at least 20 years. The Russians continued to reproduce these German prewar designs, which to copy was allowed due to law of nations. Whereas Zeiss and Japanese factories like Nikon and Canon improved these designs after the war until ~ 1958, the Russians didn't. - if it's a past-WWII East German Zeiss lens. 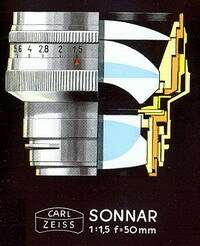 Between 1945 and 1990, there were two German companies with the Carl Zeiss name: Carl Zeiss Oberkochen in West-Germany and Carl Zeiss Jena in the East (German Democratic Republic/ DDR), both producing lenses: Carl Zeiss Oberkochen for the Contax Rangefinder, Icarex, Contax SLR made in Japan, and Hasselblad cameras. 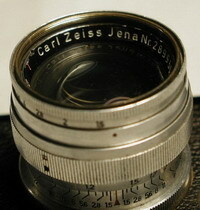 Carl Zeiss Jena (in some markets referred just as "Jena") made lenses for the East-German Contax-S, Pentacon, Exakta, Praktika, and other M42 SLR lenses. Carl Zeiss West made very few M42-lenses for the Zeiss Voigtländer Icarex 35S TM. 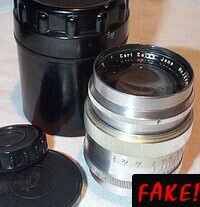 It must be added that not all Carl Zeiss (West) lenses were made in Germany. Since 1970's the "volume" series for the Contax (Japan) SLR including the Planar 1.4/50 were made at Kyocera in Japan with quality assurance by Zeiss. These lenses were engraved "Made in Japan" in opposite to "Made in West-Germany". - Every 1.5/5cm or 2/8.5cm alloy Sonnar, in particular with Leica Thread Mount (LTM) . In peacetime Carl Zeiss lense barrells were made of brass, in wartime alloy. 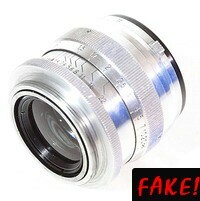 Since all Russian lenses are made of alloy, you never see a brass fake. 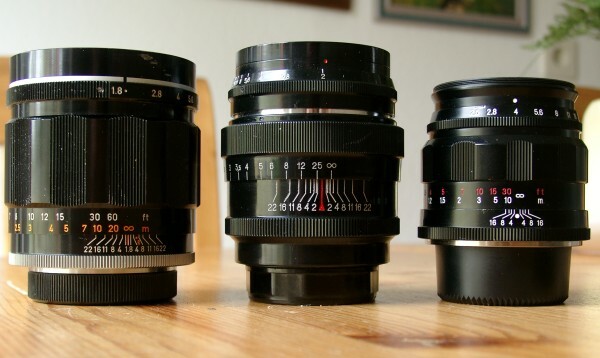 Zeiss RF lenses very seldom were made in LTM, even after the war. 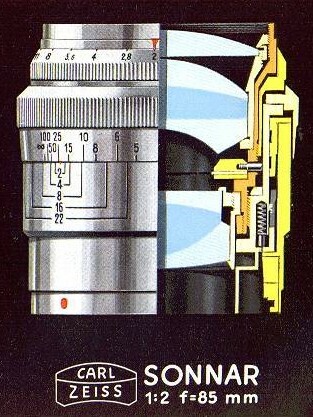 Zeiss and Leica were strong competitors at that time. The few Zeiss Sonnars made in LTM were probably made for government or military use and well-sought by Leica owners after the war. It is very unlikely to found them in todays Russia. Faked 2/85 (see Russian case and caps!) ...and not money enough to fake a red "T"
Since more than 90% of the wartime-Sonnars are fakes you have to know what you're looking for. Even true ZEISS wartime lenses were not made up to peace standards, materials and quality control. The alloy barrels don't withstand well the ravages of times. As a collector who likes to use that stuff actually I don't see a reason why to pay a lot of money for. If you have a Jupiter lens: use it, and be proud of it! It's one of the best designs in history of photography, and even by today's standard capable of making great pictures or slides. 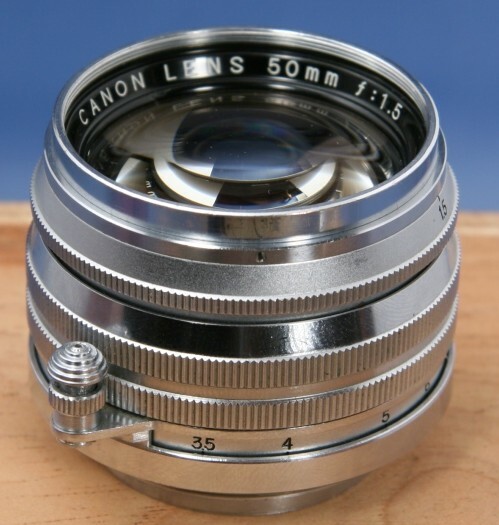 I would pay 100-150 USD for such a lens in excellent condition and well-adjusted. Canon 1.8/85 (1962 - 468g), Jupiter-9 2/85 (1968 - 314g), Voigtländer 2.5/75 (2004 - 234g). Compactness and weight not too bad for a 70 years old design! In particular the small number of nickel, and black ones are well made. I own a black Jupiter-8. It's my most compact fast telephoto for Rangefinder cameras. A Jupiter with a faked front-ring it's worth less. As a collector I cannot show these kind of lenses to knowledgable people without beeing laughed. 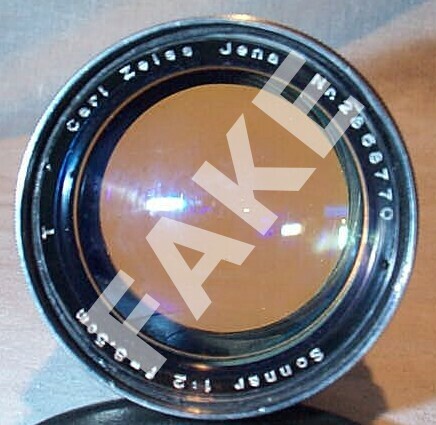 "To recap: the East German company Carl Zeiss Jena was not, as many was led to believe, a "fake" company bearing the name of Carl Zeiss to leech off the reputation of the name; it was the original company in the original factories where all the pre-WWII lenses were made. 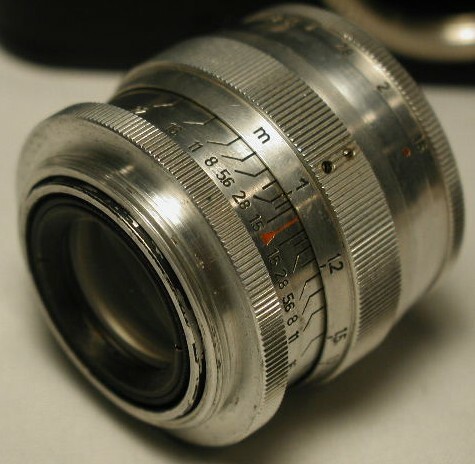 For that matter, the company name was "Carl Zeiss", as as per the custom of the time, the location of the company was also marked on the lens: in much the same way, the company who made the Leica lenses was not "Leitz Wetzlar" but "Leitz". The US forces reached Jena first and according to the agreement reached at the Yalta conference, the US occupying forces would vacate for the Soviet forces to take over administration. Thus "Operation Paperclip" was put into action: several hundred Carl Zeiss personnels were "escorted" at gunpoint, along with a huge amount of material resources, to the area destined to be under US control, so that a new optical company could be established there. The Carl Zeiss company name was registered in a hurry, and so was the Carl Zeiss Foundation. Meanwhile, the company in Jena was pretty much left in the cold but it still tried its best to get back into business, but as the original Carl Zeiss Stiftung re-registerred with the authorities a matter of days later than the new one in the west, it lost its legitimacy as seen in many overseas countries. In much the same way, Carl Zeiss Jena did that too, for not having the rights to the name it had been using since the latter days of the 19th century. 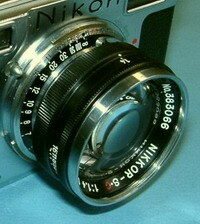 While East Germany manufactured cameras of many types. the original Zeiss Ikon company in Dresden took little time to shift from rangefinder cameras to single-lens reflex cameras, although for a number of years afterwards, Carl Zeiss Jena still produced lenses for the West German-made Contax IIa and IIIa cameras. 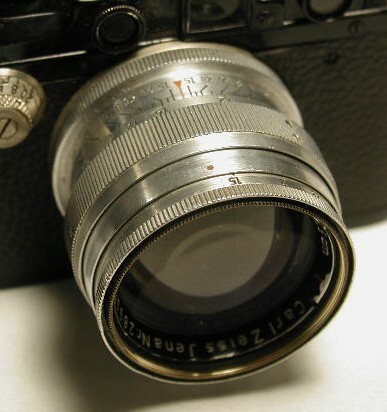 But Carl Zess Jena had to satisfy the demans of domestic manufacturers of cameras and other markets too, so apart from specialist photographic optics (such as the Apo-Germinar process lenses), the photographic lenses it produces were for reflex cameras, made by Exakta and KW (which later became Pentacon). 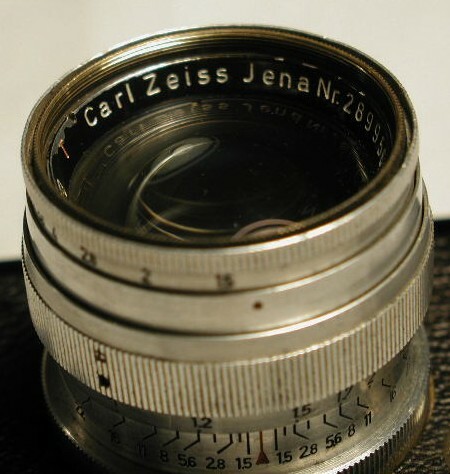 Consider the two brands 35mm single-lens reflex cameras, Carl Zeiss Jena was one of the two main supplier of lenses to them, the other being Hugo Meyer. With the exception of some short-lived detours such as Praktina and Pentina, a staggering quantity of lenses were made in Exakta, Praktica M42 screw and Praktica B mounts; the B-mount ones were of course the last made and many of completely new designs. 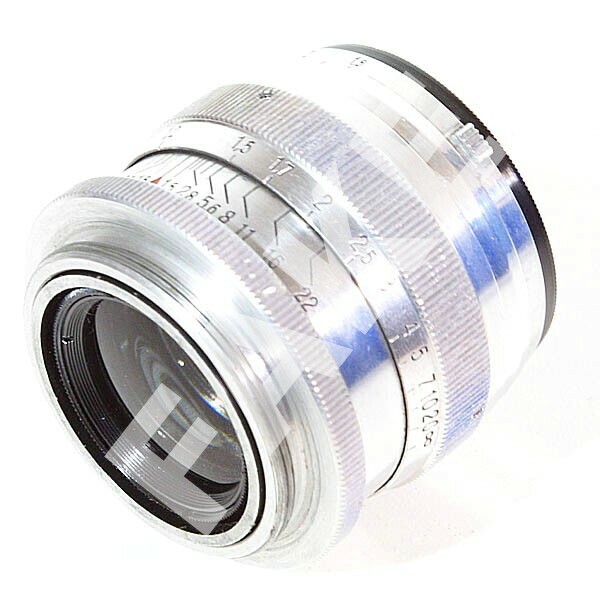 Using a M42-mount 35mm single-lens reflex would be a good way to access these Carl Zeiss lenses (along with the many fine Meyer ones too). But back to the CRF topic: Carl Zeiss Jena, after the way, did produce a series of 35mm compact cameras called the Werra, of various specifications; the top model, thte Werramatic, featured exposure meter, coupled rangefinder, and three interchangeable lenses: 35mm Flektogon, 50mm Tessar and 100mm Cardinar, all very fine performers, and with a Prestor leaf shutter with rotating blades which could give a marked top speed of 1/750s (although it can indeed run at 1/1000s with ease. (..) Another thing which has a lot of people confused is that, even before the partition of Germany, there were three organizations with the name of Zeiss. Carl Zeiss Optical came first, established by Carl Zeiss, and after his death the sole ownership passed on to his partner Ernse Abbe, who established the Carl Zeiss Stiftung who acquire Carl Zeiss Optical as one of its core dividions. Carl Zeiss Stiftung grew from that and carried on acquiring other businesses and at the same tieme diversifying, and in 1926, acquired four camera manufacturers, merged them to form Zeiss Ikon, its photographic equipment division, and based in Dresden. Zeiss Ikon bought lenses from Carl Zeiss Optical for its cameras but Carl Zeiss was of course free to supply its lenses and other products to other camera makers too. After the war, the new Carl Zeiss Stiftung, Carl Zeiss Optical and Zeiss Ikon were established in the American Zone, but only the new Zeiss Ikon in Stuttgart had any historical link with the old Zeiss Ikon, because one of the companies which was acquired to form Zeiss Ikon was the Stuttgart-based Contessa-Nettel. 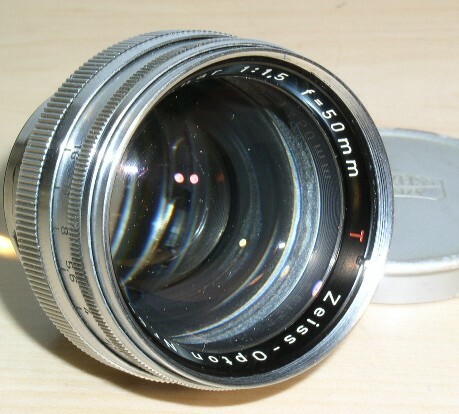 By the way, some of the earlier lenses by the new Carl Zeiss Optical (then using the Zeiss-Opton name) in Oberkochen were of extremely poor quality; while the glass parts might be acceptable, the mounting was very badly designed and would indeed disintegrate after some years; I do feel that many Zeiss-Opton Tessars were affected by this problem but not sure if those lenses made for the Contax Iia and IIIa suffered similar issues.